An urgent call to action from one of Europe's most well-regarded political thinkers. How to Lose a Country: The 7 Steps from Democracy to Dictatorship is a field guide to spotting the insidious patterns and mechanisms of the populist wave sweeping the globe - before it's too late. `It couldn't happen here' Ece Temelkuran heard reasonable people in Britain say it the night of the Brexit vote. She heard reasonable people in America say it the night Trump's election was soundtracked by chants of `Build that wall.' She heard reasonable people in Turkey say it as Erdogan rigged elections, rebuilt the economy around cronyism, and labelled his opposition as terrorists. 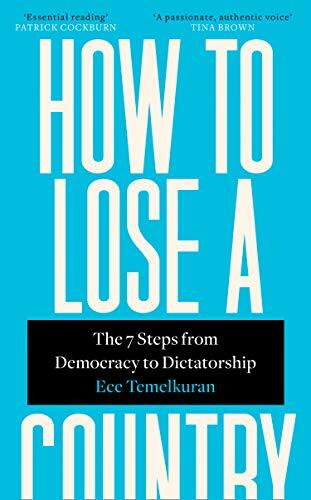 How to Lose a Country is an impassioned plea, a warning to the world that populism and nationalism don't march fully-formed into government; they creep. Award winning author and journalist Ece Temelkuran identifies the early-warning signs of this phenomenon, sprouting up across the world, in order to define a global pattern, and arm the reader with the tools to root it out. Proposing alternative, global answers to the pressing - and too often paralysing - political questions of our time, Temelkuran explores the insidious idea of `real people', the infantilisation of language and debate, the way laughter can prove a false friend, and the dangers of underestimating one's opponent. She weaves memoir, history and clear-sighted argument into an urgent and eloquent defence of democracy. No longer can the reasonable comfort themselves with `it couldn't happen here.' It is happening. And soon it may be too late.